Putrajaya is a recently developed area that has become Kuala Lumpur’s administrative center. A planned city built on a grand scale, there are wide avenues, waterways, impressive buildings, and lots of parks and greenery. 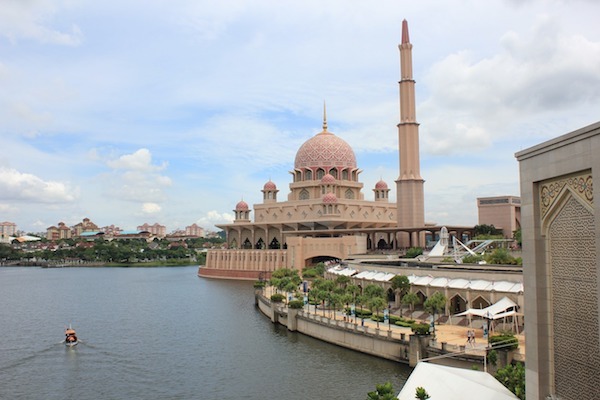 Putrajaya is 25 km south of KL — not far from the airport — and comprises some 12,000 acres. It’s divided into 11 precincts. 15k/10 mile run: Do all or part of this run. Start at the Lake Recreation Center and run through the Botanical Garden. Great views of the impressive Taman Putra Perdana. Continue running south by the Prime Minister’s Office, the Putra Mosque, and the landmark Dataran Putra Square, over the bridge and then run through the verdant Taman Wawasan Putrajaya Park for 2km. Now, either return back to the start, or for the full 15k loop, head toward the water to the Anjung Floria (botanical garden), and over the bridge, where stairs lead to the Lakeside Path, where you’ll head north for 4 km. Cross back over the Lebuh Wawasan Bridge, and then run the 2 km back toward the start. Taman Saujana Hijau & Wetlands Park Loop: This park, located in Precinct 11, is very green and features great views of Putrajaya. A loop through the park is ~3 km. For a longer, 12k run, head east for 2 km into the Putrajaya Wetlands Park, which has 2 km of pleasant green paths and then a lake section. Retrace your steps for the return, via Jalan P11a.